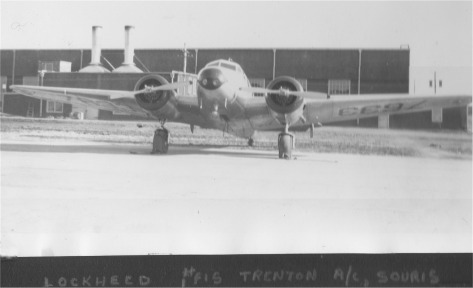 Trenton Ontario was the location of the largest facility in the British Commonwealth Air Training Plan in World War II. It opened as the Royal Canadian Air Force Station Trenton in 1929. Its official opening was in August 1931. The station motto is "Per Ardua ad Rem" - "Through Adversity to the Good," In 1937, Trenton replaced Camp Borden Ontario as the primary flying training station in Canada. Located 170 km. east of Toronto, Trenton was the location of five BCATP schools and one of five repair depots in the BCATP. 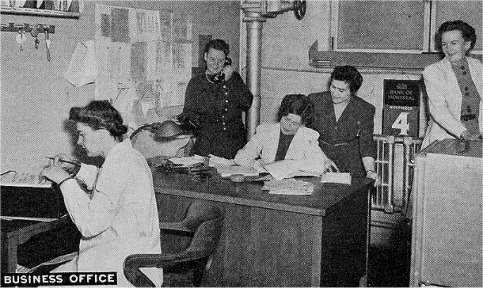 After the war, CFB Trenton became the administrative manager of the BCATP school at Mountain View Ontario which offered bombing and gunnery training as No. 6 BGS. It was open in this role for 1335 days between June 23 1943 and February 27 1945. It is 27 km. southeast of Trenton. Post war, No. 6 BGS was converted to a ground instruction school and was merged with the air armament school at CFB Trenton. In addition to an administrative school, Trenton was home to No. 1 Flying Instructors School (August 3 1942 to January 31 1945 – 912 days), No. 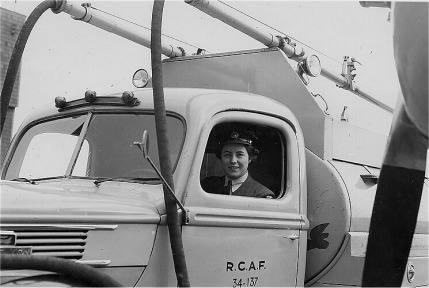 1 Air Navigation School (February 1 1940 to November 23 1940 – 296 days – moved to Rivers Manitoba), No. 1 Composite Training School and the British Commonwealth Air Training Plan’s Central Flying School (February 1 1940 to March 31 1946 – 2250 days). It operated with 3000 air force personnel and 500 civilian employees. The primary objective of the Central Flying School was to establish and maintain standards for flying instructors in the BCATP. Training for Flying Instructors moved to Trenton from Camp Borden in January 1940. It was renamed the Central Flying School in April. With the other flying schools ramping-up to full capacity, there was a great shortage of flying instructors and the CFS was challenged to meet the demand. 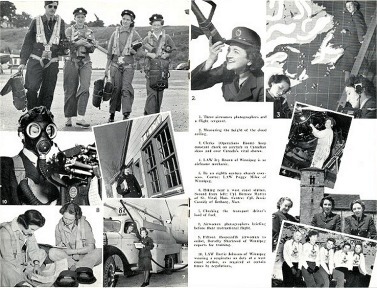 One thousand and thirty-eight Flying Instructors graduated by the end of 1941 and by August 1942, that number had increased to 2622. Still unable to meet the need for flying instructors at No. 1 CFS, the RCAF opened another three BCATP schools exclusively tasked for this training. They were No. 1 Flying Instructor School in Trenton, which specialized in training instructors for twin-engine aircraft, No. 2 FIS at Vulcan (moved to Pearce) Alberta which provided training for Harvard instructors and No. 3 FIS in Arnprior Ontario which specialized in training instructors to facilitate training for new pilots at the Elementary Flying Training Schools. No.1 Central Flying School was responsible for providing supervision of the training at these schools. No longer responsible for providing primary pilot instructor training, No. 1 CFS became the 'graduate school' for BCATP instructors. Having qualified as flying instructors, airmen were offered seminars on flying training and post graduate courses to improve qualifications for flying instructors who had graduated from one of the three FIS schools with second tier skills and knowledge. A rigorous quality control system for the Flying Instructors Schools was set up at No. 1 CFS. Officers from that school were sent on site to inspect the FIS schools and ensure training provided was up to standards. Generally these inspection trips lasted for one week and were carried out with the inspectors flying with instructors and pupils to check the instructor’s competency. At the end of the visit, the inspectors would grade the flying instructions and offer favourable and unfavourable comments about each instructor. No. 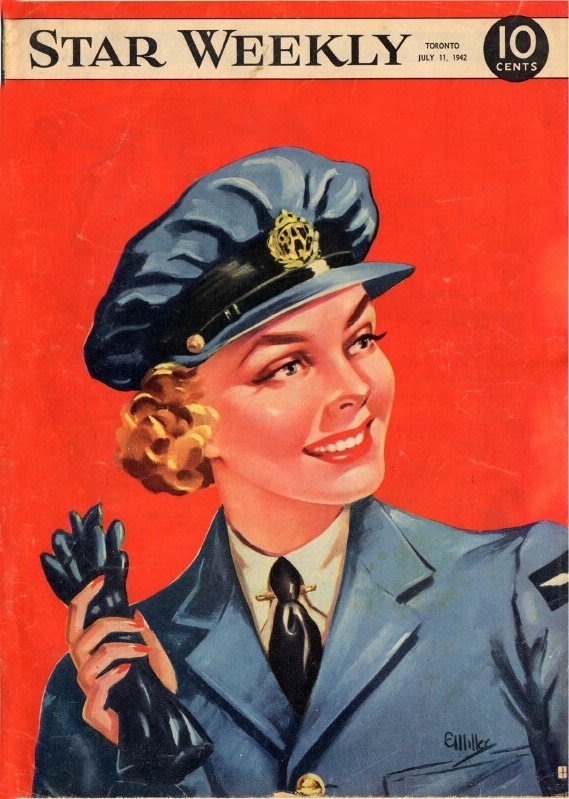 1 Central Flying School also played a significant role in flying instructor recruitment. As mentioned, the demand for instructors was high and No. 1 CFS ensured that this need was met. Favourite tactics for the recruiters included taking all of the top students, or even all of the graduating students, from Service Flying Training Schools and redeploying them as Flying Instructors in training. 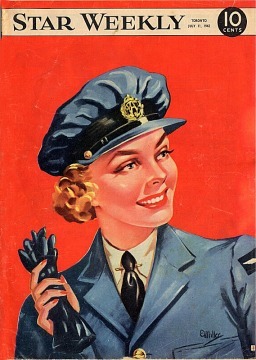 In 1942, those chosen to be instructors were required to graduate training and act as Flying Instructors for a period of twelve months. As the war and demand for training continued, the requirement was increased to 18 months. Another service offered by No. 1 Central Flying school was as a re-selection centre where those who initially washed out as pilots in favor of other air crew positions, were given a second change to become pilots by means of close coaching to bring qualifications up to an acceptable level for pilots. Today, RCAF Station Trenton is known as Canadian Forces Base Trenton and in addition to taking responsibilities for various air force functions, it is home to the National Air Force Museum of Canada. The Mountain View (Station) Detachment is now used for storage and overhaul for well-used aircraft. Trenton’s major contribution to the British Commonwealth Air Training Program and its smooth working partnerships with other Commonwealth countries during World War II has been commemorated with the building of the Trenton Memorial Gates. A number of buildings at Trenton are listed as National Historic Sites by Parks Canada. More will be offered on these subjects in the next Canada 150 Vignette. Many of the former British Commonwealth Air Training Plan stations have totally disappeared, a handful survive only as long abandoned runways in farmer’s fields. Perhaps the most extreme example of a station missing-in-action is No. 38 (Royal Air Force) Service Flying Training School at Estevan Saskatchewan. It was totally wiped from the face of the earth by the open-pit coal mining efforts of the Saskatchewan Power Corporation. Some stations exist with one, two or three buildings repurposed as machinery sheds, Legion Halls or chools. Some are still around fulfilling their original purpose – aircraft hangars still being used as hangars. Others are museums such as the Commonwealth Air Training Plan Museum which has four World War Ii buildings, three original to the site and another spitting-image replica of a Motor Transport Building. Still others have active buildings still in use by the Royal Canadian Air Force. Many stations have some acknowledgement, usually by local organizations and individuals, of place and purpose with a monument, plaque or cairn. This is the case for Canadian Forces Base Trenton (Ontario) which has had its World War II place and purpose acknowledged with a functioning monument - the Trenton Gates. Trenton’s preserved buildings have been paid homage for their pre-World War II, WW II and slightly past WWII heritages. Those buildings are in use today and registered with the Canadian Government as historic sites. We look at the Trenton Gates and Trenton’s National Historic hangars. To commemorate our country's great contribution to victory in World War II, through the British Commonwealth Air Training Plan and to highlight the smooth collaboration of the Commonwealth countries involved with the 'Plan,' Canada was presented with an impressive set of gates constructed at RCAF Station Trenton. Dignitaries from Great Britain, New Zealand and Australia came to Trenton on September 30 1949 to bestow this great honor on Canada. The wrought iron gates were dubbed "The Gates of Freedom." The crests of the four BCATP countries are mounted on each of the four gates. In return, the RCAF presented silver plaques to attendees from the Royal Air Force, Royal Australian Air Force, New Zealand Air Force and United States Air Force. Princess Elizabeth dedicated the gates in October 1951. 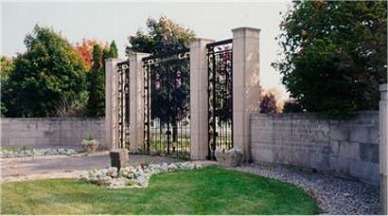 The gates were rededicated in 2009 to commemorate the 60th anniversary of the day the gates were gifted to Canada. 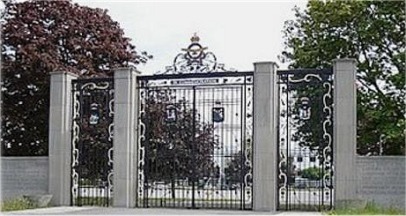 The gates are located in front of Trenton's headquarters building and parade square. 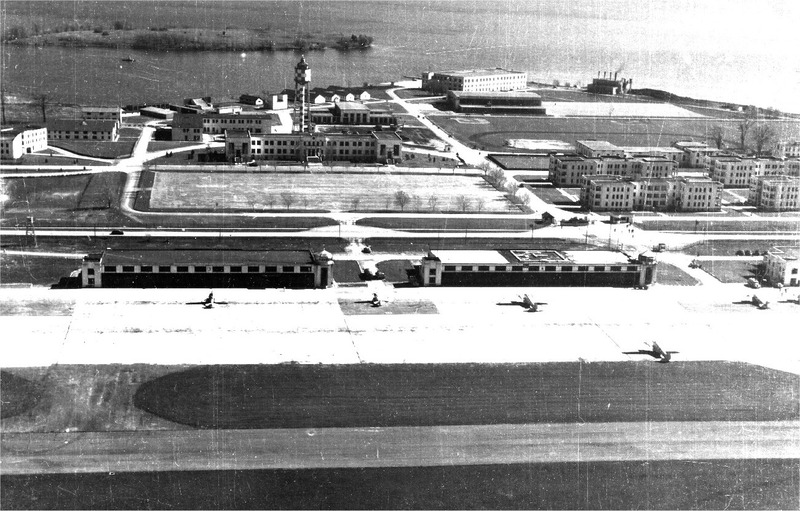 During World War II, the British Commonwealth Air Training Plan constructed over 7000 hangars at schools across Canada. All were similar in materials used and design with three characteristics which varied according to the needs for each hangar. These buildings varied in size from single to double to double-double hangars of which a single hangar was approximately 80 x 100 feet in size. The second variable was the size and configuration of lean-to structures (sheds) which may have been attached to one or two sides of the hangar. The 'lean-to's' were approximately 20 feet wide by the length of the hangar with windows and doors in many configurations. While the hangars were primarily used to store aircraft or facilitate aircraft and motor transport repair, the 'lean-to's' were heated and served many purposes including the provision of administrative space, parts storage, classrooms and mechanical rooms for the hangars. A third variable was the inclusion of a parapet on the corner of some hangars. Most often these parapets were the location of the schools control tower. The hangar's wide flat roofs were supported by Warren Trusses and spanned without support the width of a single hangar. Construction materials depended on what was locally available, or at least readily available. Hangars were constructed of brick or Douglas fir. Building 51 CFB Trenton is known as Hangar 3. It is a large, rectangular hangar with metal siding. It has a flat roof and both regular and large size doors and windows symmetrically arranged on the facades. 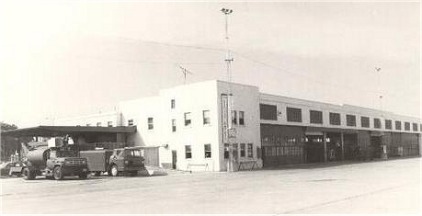 Building 49 is known as Hangar 5, It was built in 1935 and is part of a hangar line located at CFB Trenton. It is a large, rectangular workshop hangar with an exterior clad in a smooth, stucco finish. The building has a flat roof, a stepped roofline on its west elevation and a central parapet on its front. The building has regular and large doors as well as both regular and large size multi-pane windows. 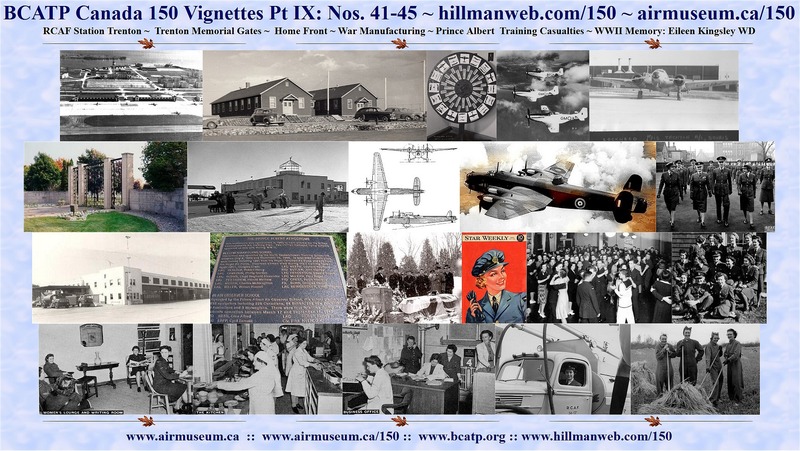 Four British Commonwealth Air Training Plan hangars are located at Mountain View Ontario formerly No. 6 Bombing & Gunnery School, and are designated as National Historic Sites. They are now a part of CFB Trenton. The Mountain View hangars are virtually identical and were built in 1940. Each are a large and rectangular brick buildings with a flat roof and sheds (lean-tos) on both sides of their central, two-storey hangar space. The buildings feature large, rectangular, fixed, multi-pane windows on all sides, and two large sliding aircraft doors with windows that run the entire length of the third wall. The hangars are located directly adjacent to the air base tarmac, and together form on site, a demarcation line between the aircraft landing strips and the auxiliary buildings. These building are designated as Hangar 77, Hangar 78, Hangar 80 and Hangar 81. A dozen or so newspapers dated from May to August 1939 came up for processing in the Commonwealth Air Training Plan Museum Archives. Newspapers were different then – the type was tiny and the size of the pages was much larger allowing for much more content. They read with language which didn’t treat the reader as if he or she had a Grade 5 level understanding of English. The content provided more information and opinion. What was amazing about these newspapers from this pre-World War II time was that readers were being told, not directly, but by inference and analysis of the stories, that the country would soon be going to war. The stories said the Nazis, Japanese and Italians were hostile and unwilling to listen to reason from any other country. They said the Axis powers were determined to start a campaign of brutal conquest and pillage against neighbouring countries. A Winnipeg Tribune article will be interesting to those wishing to know more about the British Commonwealth Air Training Plan. It is "Forbidden Places – A Series of Articles on Places Barred From the Public Which the Author has Visited." This second installment of the series, followed the writer on a visit to an aircraft factory in Great Britain. It had the feel of a propaganda piece or at least a story strongly endorsed by the British Government which apparently was cooperating with author wherever possible. The piece advised with veiled words that Britain was going to war soon and its citizens were ardently preparing defenses, months before the country actualy declared war. Today’s media would likely report the hostile actions of a future enemy, but wouldn’t suggest that a country take the ultimate step – to declare war. This article on the production of bombers makes some interesting points some of which proved to be wrong as the war progressed. That the Author Has Visited. There was a quietly suburban atmosphere about the whole district. Approaching the great, grey outline of the Handley-Page workshops I passed through long lines of neat villas which obviously housed many a Smith and Brown. Even inside the main gates the same illusion of suburban content persisted. Neat roadways and sheds with no sign of an aeroplane. It was only when I entered the actual offices that things changed. Immediately I was button-holed by an attendant. With perfect politeness he managed to ask the most penetrating questions. Then he showed me into another office. There, my credentials were examined very closely. Further cross examination followed. A brief wait. Then, at last, my guide appeared. Now I was to realize the privilege of many weeks' patient negotiation with manufacturers and the air ministry. A rare privilege. We began with a bird's-eye view of the vast workshops from a raised platform. The sight was remarkable. Stretching away in deep perspective the long shops ran, with myriad workmen intent upon the thousand different parts which go to make Britain's bombers. There was the heavy hum of machinery, constant movement and an air of absolute privacy about each group of workers. Then we descended and entered the first section of this forbidden factory. Immediately you become aware of their system. The first shop dealt with tails only. Next came bodies. Then wings, wheels and engines. Starting from the top and going to the bottom you traced the formation of a complete aeroplane from the moment the simple and rather absurd tail joined the body, until wings were added and finally, engine and wheels. Apart from the fact that this system facilitates mass production, it also makes for secrecy. Every workman has his own particular jig and has made a specialized study of one part of an aeroplane. The term "jig" means a mould or metal frame, from which will come just that one fragment of an aeroplane. It is correct to a thousandth part of an inch. Working exclusively on one jig any given workman knows intimately the part he produces, but little else, and even if he wanted to give away information, it would be very limited. Actually the workmen are very carefully chosen and remain closely loyal. Anyway, the completed aeroplane involves somewhere in the neighborhood of 85,000 parts. Piecing any information together from workmen scattered amongst such a vast number of parts, is almost impossible. The Handley Harrow was introduced to the Royal Air Force as a heavy bomber which under the stresses of combat proved to be inadequate in this role and was reassigned to duty as a transport aircraft. It was a twin-engine, high-wing monoplane with fixed undercarriage. It was capable of carrying 3000 pounds of bombs of which 2000 pounds was the biggest a bomb could be. One Hundred Harrows were delivered in 1937. 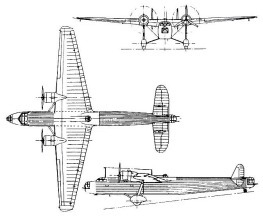 By the end of 1939, the Harrow was phased out as the RAF’s primary bomber. Despite its changed role to transport, it was used for a unique mission in the Battle of Britain. Six Harrows were used to tow Long Aerial Mines (LAM) into the paths of enemy bombers. Although they were credited with destroying six German Bombers, the RAF felt this mission was not successful enough to be continued. In addition to transport work, the Harrow was used for air-to-air refuelling of Short Empire Flying Boats. Two even made it to Canada for service with the RCAF. 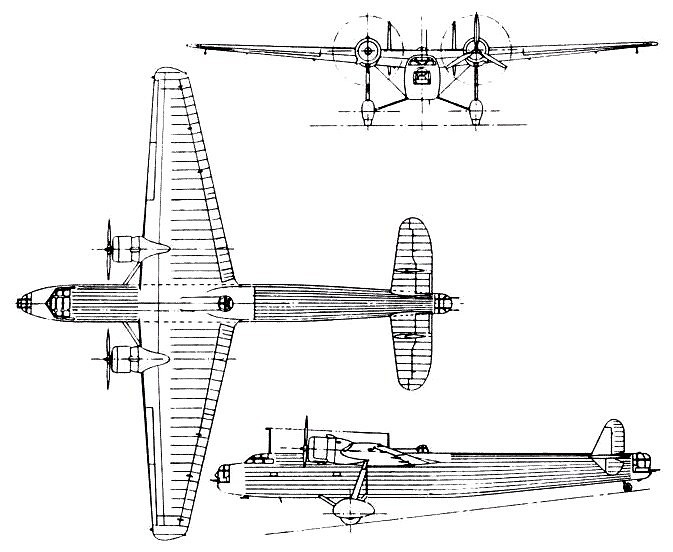 The Harrow was a forerunner of the Handley Page HP56 which begat the Handley Page HP57 – the Halifax Bomber. Next my guide shepherded me between whirring drills, pipes and benches, to the wing spar of a Harrow bomber. It resembled the skeleton of a dinosaur. I was invited to lift one section standing nearby and declined. It looked quite beyond me. My guide pressed me, and at last I gripped it firmly with both hands and braced myself to take the weight. The section came up easily. I could almost have lifted it with one hand. Duralumin, the foundation metal of the modern bomber, has two vitally important characteristics. It weighs about two-thirds less than steel, and yet has the same strength. Wing sections which look enormous standing on the ground, can easily be lifted by one man. Near where we stood they were laying down a jig for the new Hampden bomber. This was produced as an answer to the problem of the heavy bomber. It is a monoplane capable of carrying unusually large loads. Under the terms of the Official Secrets Act I cannot reveal the actual load, but in its class this machine will carry a heavier load of bombs over a greater distance than most of notable other types so far produced. My guide moved me along to the benches where bomb release gear was in process of production. 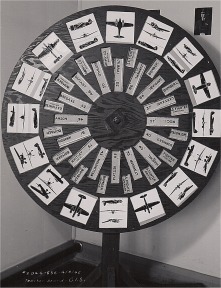 The Handley-Page patent bomb gear has several unique features. The button for the release of bombs is so protected that only by deliberate application of finger or thumb can you operate the mechanism. In the "off" position no one can stumble against the control and accidentally let loose the bombs. It has to be done intentionally. Supposing a situation arose where it became necessary to jettison the complete load of bombs, they would be released in a "dead" condition. The whole of this intricate mechanism is electrically operated. While my guide explained the deeper technicalities behind the gentle art of bombing, I became conscious for the first time of the real atmosphere of this vast workshop. Immediately on my left a man wearing dark goggles bent intently over his searing jet of flame, welding part of a wing section. I could feel the heat from where I stood. The flame threw dancing lights across his glasses. There was something a little devilish in his appearance. Yet he, like everyone around him was quietly absorbed in his work. Obviously no thought of war and destruction bothered him. He might look the part of the destroyer in his goggles and overalls but as I later discovered, hidden underneath that mask was a gentle, elderly face, in quiet repose. How was it, when they spent their lives producing machines deliberately devised to destroy, that they remained happily content? Then. suddenly, I realized their attitude. These men did not think of their products in terms of destruction and war. They thought of them as the means to prevent war. They were working for peace and peace alone. With that thought I became aware that my guide was smiling a little acidly. Of course I had not heard his last few sentences. I apologized hastily and he thought the moment opportune to move along. We paused next to a special wing section fitted with peculiar slot devices. This again is a Handley-Page specialty. It gives the big bomber several advantages. Heavily loaded, the machine can take off with quite a short run provided the slot device is properly adjusted. In any situation where emergency measures become necessary the slot greatly increases control over the plane. You can land a heavy Harrow bomber at remarkably low speeds by using the slot device. Next we paused outside the experimental department. A mere handful of experts alone have ever entered this department. Here, in collaboration with Air Ministry officials, the Handley-Page experts commit to paper all the latest designs and devices produced by the best aeronautical minds in the country. It is impossible for the ordinary individual to enter the actual workshops which are producing Britain's new bombers. They are forbidden. Even stricter regulations surround the experimental department. They guard with more than jealousy the plans and blue prints you see there. Equally hush-hush are the large models, exquisitely fashioned, which cost anything up to £250 each. They represent the first experimental form of the ideas conceived on plan and blueprint. They are accurate in every detail, and are handled by experts alone. Outside the experimental department we paused to discuss one of the latest developments in modern bombers. Still largely in the experimental stages it would revolutionise the whole business of flight if it is perfected. Experts are aiming to produce a screen in the pilot’s cabin with the plane's course traced in red down its centre. Television apparatus would throw upon this screen a miniature picture of the actual plane in flight. Thus whenever the pilot diverged from his true course, he would know immediately by the reflected imagine on his screen. Still following that image he could bring the plane back directly to its course. From the experimental department we moved to a new job specially set down for the Hampden bomber. My guide paused to explain further details of this remarkable machine. The fuselage is narrow to reduce the total drag of the machine without in any way interfering with the gunner's cockpits. The crew's range of vision is unusually large since the narrow fuselage permits a steep view earthwards on both sides. The gunner in the tail can sweep the whole area to the rear from plane to earth. Its actual speed I am afraid I cannot divulge. At this point in my tour I thought it might be as well if I got to know my guide a little better, and after some few more personal preliminaries I quietly asked his full name. He could only give it to me, he said, on condition that it was not printed. Everything here is supremely impersonal, quite secret. They do not believe in spreading abroad names or personalities. That might suggest a cypher-treatment of the whole staff, the system of men becoming numbers in a machine. So far as their welfare is concerned nothing could be farther from the truth. Every possible facility is provided for the men. Their hours of work are most carefully regulated. 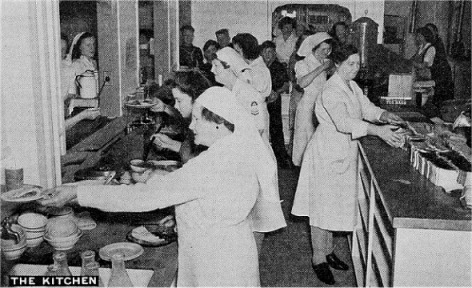 They have their own nurse and first aid station on the spot, and can enjoy an excellent lunch in their private restaurant for the remarkable figure of eight pence (16 cents). During working hours in this forbidden factory they are rapt in their different jobs and see the whole business very unromantically. One exclusive group of men alone find the real stuff of drama in their work. The test pilots. . . These men who take newly designed bombing machines into the air for the first time are odd people. They combine a detached, philosophical attitude to living with a zest for thrills and adventure. They are men of blood and iron who prefer to talk of other things than test-piloting. I persuaded one of them round. At last he set down something of his thoughts and reactions during one .of these deadly terminal velocity dives. . . . Humming gently to himself he put the bomber through its preliminary tests. Minor affairs these. When those Johnnies down below did make a miscalculation it usually came to light late in the test flight. Odd there wasn't more trouble. A decimal mark m the wrong place, a mere dot among numbers, could so easily spell death for the test pilot. Particularly with newly designed machines like this. . .
Well, now for it... The most terrible test of all,. Up she goes… With shrill whine the plane rears at the skies. Twenty-one thousand feet and level her out… Everything given a quick once over. . . Parachute right . . . O.K.. . . Down with that nose... The speed indicator leaps to three hundred. . . The earth is rushing up. . . .
Three hundred and fifty, three hundred and seventy, four hundred miles an hour. . . .
Face feels stiff behind its protecting mask. Air pressure becoming unpleasant . . . A queer, sweet-sickness in the mouth . . . The speedometer needle has slackened in its mad race towards the maximums. Soft spurts of blood from one ear. Had that before . . . Unimportant . . . Almost on maximum speed . . . Will the machine stand it . . . Or . . .
Now. get her out of this inhuman dive. Slowly back with throttle and stick. . . Can feel the whole body tensing to the terrible strain. . . She's answering beautifully. . . Something between a sigh and a whistle, and now for the ground. . . .
Five minutes later, the great gray warplane is at a standstill. She has survived the most exacting tests and is ready for service. 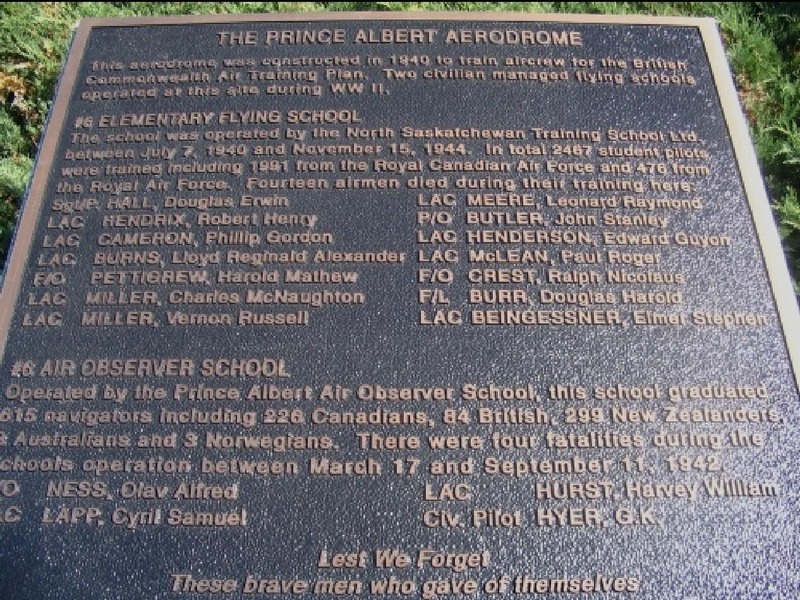 The City of Prince Albert Saskatchewan has fond and sad memories of the BCATP Schools that were located nearby during World War II. It has honoured the nine instructors (one civilian) and 11 students who were killed in training accidents at No. 6 Elementary Flying School and No. 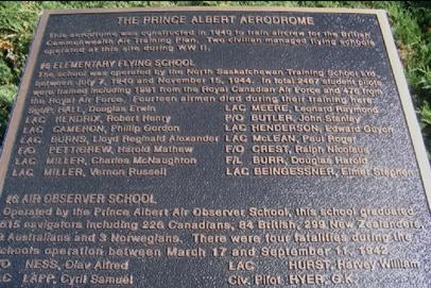 6 Air Observers School with an impressive plaque at the site of the schools, now the Prince Albert Airport (Glass Field).The Prince Albert Daily Herald also honored the BCATP fatalities with a news story published on November 10, 2012 with details of those who were killed and the accidents in which they were involved. The story is presented below, as it was written. The story sadly highlights the dangerous consequences of training for a small number of those who were at Prince Albert during the war. Nine accidents killed five instructors and nine students at the No. 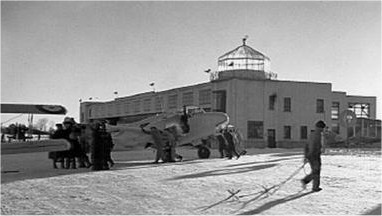 6 Elementary Flying School in Prince Albert during its operation from July 22, 1940 until it closed November 15, 1944. June 21, 1941 Sergeant Douglas E. Hall was killed instantly when the Tiger Moth he was in, crashed out of control at 7:45 p.m. at Round Lake, sixteen miles north-west of Prince Albert. At the time he was instructing Leading Aircraftman D. H. Read who was seriously injured but survived. Twenty nine year old Hall was due to leave shortly for overseas service as a commissioned officer. Sgt. Hall was the son of William and Margaret Hall of Danville, Quebec. He is interred at Danville Protestant Cemetery in Danville. July 27, 1941 Leading Aircraftman Robert H. Hendrix lost his life in a drowning accident at Waskesiu Lake. He succumbed to a seizure while swimming with his twin brother LAC Ralph M. Hendrix and fellow American students; LAC S. M. Benford of Florida and LAC W. Alsworth of Texas. Twenty year old Hendrix was the son of William and Mary Hendrix of Walsenburg, Colorado. He is interred at the Masonic Cemetery in Walsenburg. August 15, 1942 Leading Aircraftman Philip Gordon Cameron was electrocuted when the aircraft he was flying with his instructor hit high tension wires. They were attempting a night landing at 2:15 a.m. just west of Melfort, Saskatchewan. Twenty-three year old LAC Cameron was killed instantly. He was the son of Gordon and Delphine Cameron of Shamrock, Saskatchewan. He is interred in the St. Charles Cemetery in Coderre, Saskatchewan. Cameron Lake in northern Saskatchewan is named in his memory. October 25, 1942 Leading Aircraftman Lloyd Reginald Alexander Burns was killed as the result of a mid-air collision during formation training north-east of White Star (north of Prince Albert). The twenty year old student was solo at the time. The student pilot of the other aircraft parachuted to safety. LAC Burns was the son of Thomas and Ethel Burns of Vancouver, British Columbia. He is interred at Ocean View Burial Park in Burnaby, BC. July 20, 1943 Thirty-four year old Flying Officer Harold Mathew Pettigrew and his thirty-two year old student; Leading Aircraftman Charles McNaughton Miller, were killed in a crash six miles west of Prince Albert. FO Pettigrew had been instructing at the school since September 1942. He was the son of Bernard and Annie Pettigrew of Hamilton, Ontario. He is interred at Eastlawn Cemetery in Hamilton. LAC Miller was one week from graduating the EFTS course. He was the son of William and Mary Ann Miller, husband of Catherine Miller and father of a two year old son; all of St. Vital, Manitoba. He is interred at Elmwood Cemetery in Winnipeg. September 16, 1943 Twenty year old Leading Aircraftman Vernon Russell Miller was on a solo training exercise when he crashed twenty miles northwest of Prince Albert. He was the son of Russell Duncan and Ena R. Miller of Smeaton, Saskatchewan. He is interred at Southill Cemetery in Prince Albert. September 23, 1943 Leading Aircraftman Leonard Raymond Meere was the solo pilot and died instantly when his aircraft dove into the ground at high speed five miles north of Prince Albert. He was the nineteen year old son of Thomas and Edith Meere of Sarnia, Ontario. He is interred at Lakeview Cemetery in Sarnia. November 24, 1943 A mid-air collision between two Tiger Moth aircraft took the lives of four airmen; two instructors and two students. Pilot Officer John Stanley Butler was the twenty-six year old instructor of one aircraft and had been stationed in Prince Albert since March. He was the son of Mr. and Mrs. William John Butler of Orilllia, Ontario and husband of Etoile V. Butler of Detroit, Michigan who was residing in Prince Albert. He is interred at Forest Lawn Cemetery in Detroit. The other instructor was twenty-six year old Flying Officer Ralph Nicolaus Grest. Seriously injured, FO Grest escaped the crash by parachute. However, he succumbed to his injuries 10 days later. He was the son of Nicolaus and Lydia Grest of Humboldt, Saskatchewan and husband of Dorothy Grest of Maidstone, Saskatchewan. He is interred at the Watrous Cemetery. Grest Bay on Highrock Lake in northern Saskatchewan is named in his memory. Leading Aircraftman Paul Roger McLean was the twenty year old student in one plane. He was the son of Martin and Greeta McLean of Toronto, Ontario. He is interred at Mount Hope Cemetery in Toronto. Leading Aircraftman Edward Guyon Henderson was the nineteen year old student in the other plane. He was the son of Roland and Euphemia Henderson of Windsor, Ontario. He was a graduate of J. C. Patterson Collegiate in Windsor. Just months before his death LAC Henderson had been refused service in a downtown Windsor restaurant because they did not serve ‘coloured people’. He is interred at Grove Cemetery in Windsor. June 17, 1944 The last accident in the school’s history took the lives of an instructor and student. It occurred seven miles north of Prince Albert and was the result of an in-flight break-up of their Fairchild Cornell airplane. 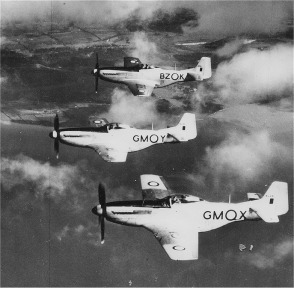 The right wing separated from the aircraft during spin training. The instructor was twenty-eight year old Flight Lieutenant Douglas Harold "Hal" Burr. He was the son of Frederick and Mary Burr of Vancouver and husband of Euphemia Marquis Burr of Kelowna, British Columbia. He is interred at Kelowna Memorial Park Cemetery, Kelowna, BC. The student was twenty-one year old Leading Aircraftman Elmer Stephen Beingessner. He was the son of Frank and Mary Beingessner of Brant, Alberta. He is interred at Highwood Cemetery in High River, Alberta. No. 6 Air Observer School There was one accident at the No. 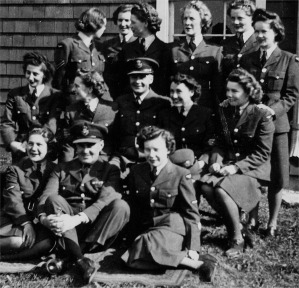 6 Air Observer School in the eighteen months that the school operated at Prince Albert from March 17, 1941 to September 11, 1942. Four people lost their lives on the night of March 18, 1942. Avro Anson Mk. 1 R9740 crashed at 8:30 p.m., forty miles south-east of Prince Albert (six miles south of Kinistino) during a night navigation exercise. Mister Glen Kenneth "Doc" Hyer was a thirty-four year old civilian Instructor who had been at the school since June 1941. He was the son of Dr. Irving and Maude Hyer of Clarendon, Pennsylvania. He was living in Prince Albert with his wife, Helen Ann Hyer and their children Craig and Dennis. He is interred at Oakland Cemetery in Warren, Pennsylvania, USA. Flying Officer Olav Alfred Ness was the navigation instructor. FO Ness was thirty-three years old. He had been instructing at the school for several months and was residing in Prince Albert with his wife Pearl. He was the son of John and Gunda Ness of Sturgis, Saskatchewan. He is interred at Woodlawn Cemetery in Saskatoon. Leading Aircraftman Harvey William Hurst, age twenty. He was the son of Albert and Ida Hurst of Gravenhurst, Ontario. 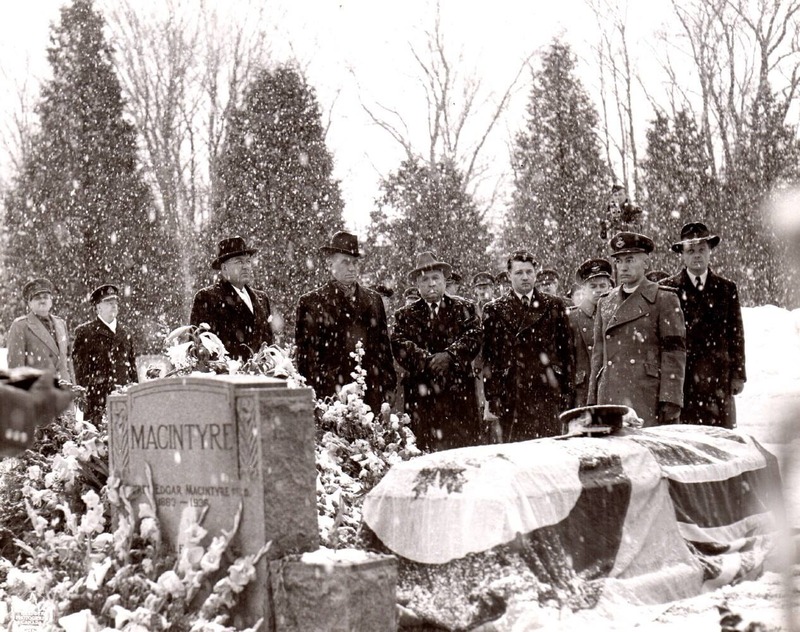 He is interred at Lakeview Cemetery in Gravenhurst. Leading Aircraftman Cyril Samuel Lapp, age twenty-seven. He was the son of Samuel and Mary Lapp and husband of Mildred Lapp of Dunnville, Ontario. He is interred at Riverside Cemetery in Dunnville. The following service history was received at the Commonwealth Air Training Plan Archives on March 2, 2001. The first group of young men left our small village of Codette, Saskatchewan in 1939, and as each came of age, many more joined up. War was not a stranger to me as my Dad, Cecil Kingsley, was wounded at Vimy Ridge at the age of sixteen, and suffered from his wounds during his short life. He lied about his age, and by the time the authorities discovered it, he was in France and wounded. 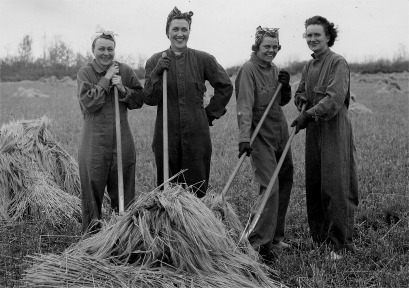 The loss of so many of our young men in the Second World War resulted in a shortage of help on the farm, and I remember driving a stook team in harvest at thirteen years of age. Every part of the country was affected by the war. Rationing was in place and sugar in short supply. Young women lost their sweethearts, and many more were replaced by a British lass - one of my good friends is a British war bride. I was living in Winnipeg, Manitoba prior to enlisting, and many of the boys from home would call on me on their way to embarkation in Halifax. I think this gave me the added incentive to take an active part. Sometimes I was the last "face from home" before they went into action. My mother was a bit upset, but my Dad was proud. My adventure in the Air Force began with my enlistment in Saskatoon, Saskatchewan on July 20, 1943, the day after my 18th birthday. Being away from home wasn't new, as I had been working in Winnipeg, Manitoba as a stenographer following training at the Saskatoon Technical School. I completed high school at 15. We boarded a train and headed for our basic training depot at Rockcliffe, Ontario, outside of Ottawa. Some of the girls were right out of school and pretty homesick. We were fitted with uniforms and our kit, and soon learned to keep everything neat as we didn't know when we'd have inspection. Getting an upper bunk was smart, as it didn't get messed up with friends sitting on your bunk. We had route marches around the area and endured many blisters. Our Sargent (Stinky Stinson we nicknamed him), was a good scout, and would let us break off and rest in the lovely warm sunshine. Our three months of basic training soon passed, but in the meantime, we had seen the sights of Ottawa. A few of us who wanted to be Wireless Operators were sent to Number One Wireless School in Montreal. Our barracks were in the wealthy Westmount area on Cote de Neige, across from the Cathedral. Our training was intense: up early; classes up and down the five storey building, and after parades, etc. we were ready for bed. They told us it was a two year course compressed into six months. One of our teachers had been employed by Canadian Press and could take messages reply, and carry on a conversation at the same time he was operating. This was Morse code. He was my inspiration. Our stay in Montreal was not all work and no play. New Year's Eve, a friend and I went to a dance and the pianist in the orchestra was Oscar Peterson. He was about eighteen, I think, and even then, the dancers stopped to listen to him play. Strange what sticks in the memory. I remember the smell of garlic on the buses. The French cuisine, I guess, used garlic which I wasn't used to in my family. Montreal was a most interesting city. We had a weekend leave and my friend, Kay, and myself decided to visit New York and see what the Big Apple was like. We took the train and I can still visualize all those tracks leading into Grand Central Station. We stayed at the Lady Roosevelt Hotel which was a "ladies only" hotel. They had all kinds of free tickets to the sights, and we took in as many as possible. 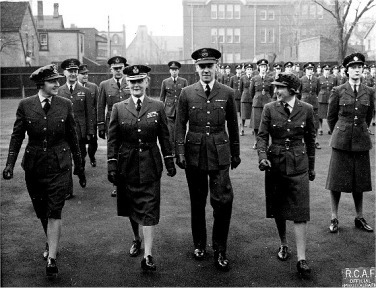 Service women from Canada and the U.S.A. army, navy and air force, mingled together. We danced at the Stage Door Canteen, watched skating in Times Square, visited the Empire State Building and St. Patrick's Cathedral. We took in a show at the Radio City Music Hall where the famous Rockettes were dancing. I'm sorry to say I slept through most of the performance! It was a wonderful weekend, but we were soon on our way back to Montreal to our training. Kay and I still keep in touch. increase in pay. I don't remember what we were paid. It was also supposed to give a choice of postings. My request was a western move, but instead I was sent to Number 8 Transport Squadron at Moncton, New Brunswick, via Halifax, Nova Scotia. The three weeks I spent in Halifax were cloaked in fog, so it was years later before I could explore that interesting city with my husband. ended with a return to base because of smoke in the cockpit. If it happened now, I would show a lot more concern. I was on shift when we learned of the D-Day landing. It was a great worry as so many of my friends were involved. the big name bands from the U.S.A. entertaining. 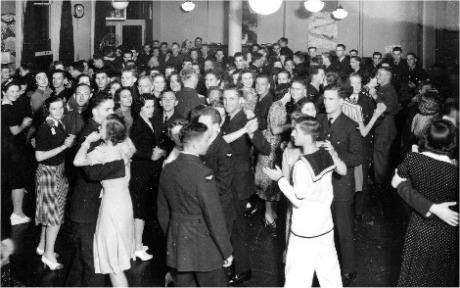 The Royal Air Force embarkation base was close by, and the English airmen invited us to their dances. We thought it odd that the men often danced together. I expect it was for lack of females. We danced the Hokey Pokey and a lot of mixer dances that we hadn't experienced before. My corporal stripes came with a posting to Yarmouth, Nova Scotia where my role was as a shift supervisor. This included supervision of the men and the older operators. They accepted me as one of them. We were a listening station and weather collector from various weather stations in the area. Our orders were not to break silence except in an emergency. One day, an operator on my watch received an S.O.S. "Mayday" from an airplane in trouble. He was afraid to reply, so I took over his post, got their position, and contacted Halifax by teletype. The plane crash landed on Sable Island but a rescue crew was sent out. Thankfully, no one was killed. Yarmouth was a well run station and a training area for the British Fleet Air Arm which used the flimsy looking Tiger Moth. Years later we read of a scandal about service personnel selling food from the kitchen. The meals were much better than at Moncton, even if they sold some of the food. We had a good time and the W.D.s were always in demand at dances. I always regretted that I didn't learn how to jive - felt too self-conscious. Years later, my husband and I visited Yarmouth and felt very nostalgic when we went down to the spot where the bus used to turn around - nothing had really changed. We were treated with great respect by the wonderful Blue Nosers. When VE Day finally arrived, we were joyous. I recall one of the officers walking down the street with a gallon of "pink lady" under his arm. Everyone was celebrating. It was a privilege to know so many great people. One of my favourite people was Flt./Lt. Richard, our chaplain. He brought peace to many a troubled heart and I wish I had kept in touch. My ambition had always been to become a nurse, and when we were given an opportunity to take early discharge, I applied so I could join the September training class. 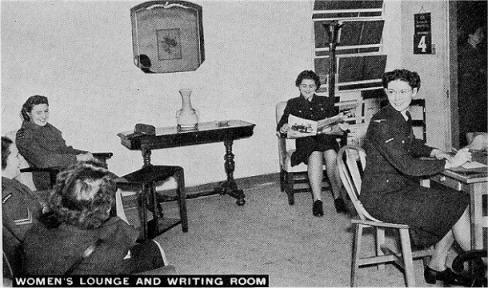 I was discharged in Winnipeg, Manitoba at Number 5 Release Centre on June 22, 1945. My classmates were envious of the $60 a month I received for the two years spent in the service. I saved enough in those two years to pay for my third year at St. Boniface Hospital, Manitoba. We celebrated our 50th anniversary of graduation in 1998. Strangely, when I started nursing I was homesick - not for my parental home, but for the companionship and closeness the service provided. It was a great experience, but one we hope not to have to be repeated. My life has been a most interesting experience, and now I enter a new phase as my beloved husband, Lawrence Pierce, died at Christmas. He was my life partner for fifty years. Eileen Pierce died on July 7, 2016 in Brandon Manitoba at the age of 90 years.